Saying goodbye to March with a colorful outfit. 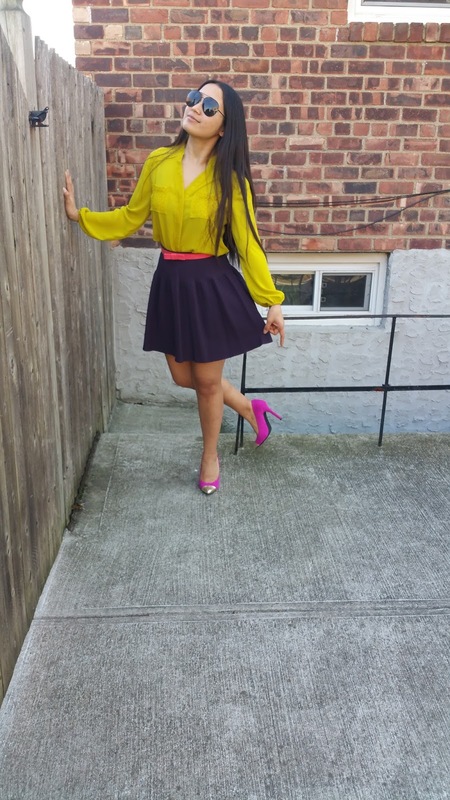 I have on a neon yellowish blouse with a purple skirt. Added a shiny coral belt with a bow and hot pink cape toe heels to complete my colorful ensemble. Color Burst!! Οh, yes! That's exactly how I would call it!! The colour combo suits you so well! She looks like the new Barbie doll ! Wow, so eye-catching... amazing color combo!!!! Love the colours in this outfit...and your cute doggie! And your pointed pumps are amazing. Perfect post! Great outfit, it's so sweet. View my blog, if you went. i love the heels! and also the looks! Very nice outfit! I like the colors eventhough i dont have much of them in my wardrobe. Great look!!! Have a nice day!!! Love the colorlful look on you, Vikee. Look maravilhoso amei, te desejo uma semana abençoada. Feminine outfit! Definetely i love your yellow blouse! Very cute, perfect color combo very spring like. Your blog is very beautiful and interesting!!! do you want to follow each other? let me know! Even though I am not so into colors I have to say that I love this look!